Any tourists may have a preconceived idea of traditional Greek islands but it’s probably quite different from the reality of the seven main islands of the Ionians. Unlike the harsh, arid landscapes and white-washed houses that mark the islands on the eastern side of Greece, on the western side of mainland Greece, the Ionians are lush, green and soft. Even the architecture is different – houses in the villages feature red-tiled roofs and walls daubed in brilliant pastels, hinting at their Roman-influenced heritage. It’s a heady mix – warm, vibrant colours contrasting with the verdant green landscape and clear waters and larger-than-life, friendly Greek hosts. Thanks to our rampant Kiwi dollar, the islands are relatively inexpensive. In short – the islands were a wonderfully dry, sunny escape from a New Zealand winter when we took a 14-day yacht charter there in September. Benign and predictable sailing conditions make for a popular cruising area. The cruising guides say that from May to November the wind blows northwest at Force 2 – 5. The direction is correct, but it’s more like Force 1 most of the time. Hoisting sails is a novelty. In 14 days we hoisted our main only three times – and still motor-sailed. The wind – such as it is – typically arrives around lunch time and dies at sunset. This makes for an easy sailing schedule. It’s all eye-ball navigation and there are no currents or tides to worry about. Distances between islands are one to three-hour passages with scores of bays dotted around every island. At the head of every bay is a little village, typically with a long quay for mooring, stern-to. Some quays offer lazy lines, but mostly it’s a case of dropping the pick and reversing in, with enthusiastic restaurateurs standing by to grab your stern lines. Most – but not all – of the mooring is free, with there’s an unspoken agreement that, in return for the mooring, you will eat at the adjoining restaurant. Many quays have shore power and water; all the restaurants have free WiFi. Again, the password is accessed in return for dining there. As with any popular cruising destination, the major issue is getting to your next port relatively early to secure a good position on the quay, where there are usually between four to 30 tavernas and plenty of shops. For the more energetic, there are good walks, though the heat, even in September, tends to dissuade you from long hikes. Stern-to mooring isn’t compulsory, and many cruisers prefer to anchor around the periphery of the bays, running long stern lines ashore and coming in by dinghy, but quay mooring is extremely convenient, even if the all-night parties can be a little boisterous. The Ionian cruising season runs from May to November but September is ideal to miss the bulk of the crowds and to find cheaper charter prices. 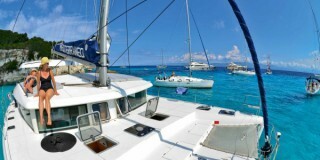 Our bareboat party comprised three couples on a Lagoon 42 catamaran. Equipped with four double cabins, each with an en suite bathroom, we had more than enough space and the air-conditioning was welcome when connected to shore power at night. The Lagoon was fitted with an inverter and a generator, ideal for charging phones and iPads. Catamarans have pros and cons. They offer masses of space, great areas for chilling, no heeling and, with their inherent stability, the likelihood of unsettled tummies for those prone to mal de mer is slim. Twin engines help when easing into tight berths. Space is a cat’s biggest appeal and its biggest drawback. Securing a berth for the night operates on a first-come, first-serve basis and it’s doubly difficult for a cat. You have to arrive at a port by around lunch time, when all the monohulls have left and before the next influx arrives, and even then it often requires getting the boat into an improbable space. Multiple charter companies operate at two main bases in the Ionians, at Corfu and, further south, at Levkas. Depending on your budget and available time, you can opt for one or two weeks. Two weeks allows you to explore many more of the islands, particularly if you opt for a one-way cruise as we did, in which you deliver the boat to a different port. We picked up our boat in Corfu and sailed south, stopping off at Plantaria and Mourtos on the mainland before heading to Levkas, Meganisi, Paxos, Antipaxos, Cephalonia and Ithaca, and then returning the boat to Levkas – about 250 miles all up. It’s difficult to pick a favourite island and port – they’re all colourful, charming, welcoming – but Kioni on the island of Ithaca is among my top three. According to legend, Ithaca is the birthplace of Homer – the poet and author of the Iliad and Odyssey epics, not the chubby kid from The Simpsons – and it’s utterly beautiful. Spartahori, a bay on the island of Meganisi, offers some of the most majestic views over the Ionians. It’s a long, sweaty climb to the tiny village at the top, but the beer that greets you is ice-cold. Spartahori village, like most of the villages in the islands, is swathed in brilliant bougainvillea but has never enjoyed the services of a town planner ­- it’s narrow roads are unbelievably convoluted. The restaurant down at the water’s edge, where owner Babi reigns supreme, is legendary throughout the islands. He runs a lively and hilarious operation involving the entire extended family. Grannies, aunts, cousins – and lots of the children – are the waiters/chefs/washing up crews. His brother, a fleet-footed chap, divides his time between cooking and dashing out in the dinghy to help yet another late-arriving yacht on to the quayside, no doubt securing their meal orders at the same time. The quay was designed for, say, 20 vessels – he easily squeezed in about 40. Many were simply moored erratically to other boats. Leaving the next morning required delicate manoeuvring. Enormous fun. Paxos and its smaller sister Antipaxos are particularly attractive. The latter’s Emerald Bay is a favourite day anchorage and large ferries also bring in scores of day trippers from the mainland for a swim in its pristine waters. Fiskardo, the northernmost port on Cephalonia, is an excellent base for more extensive exploring. We hired two cars there – they don’t have vehicles for six people – for a day trip around the island. In the centre of the island is an unusual geological feature, an underground lake with only a small roof aperture letting in light. A boatman punts you around in a small wooden skiff – eerie, but spectacular. Lunch at the waterside restaurant in Asos, a tiny village on the western side of the island, offers the world’s best crispy sardines – bar none. Despite Greece’s fragile economy and debt crisis, there is zero evidence of financial hardship in the Ionian Islands. This could be because the restaurants and shops operate on a cash economy and credit cards are rarely accepted. The islands are magical. Greek cuisine offers scores of traditional standards: souvlaki – skewers of lamb, beef, chicken or seafood or a mix of all; moussaka and gyros, with the inevitable tzatziki – cucumber and yoghurt dip, and aubergines swimming in olive oil. I don’t know what they do to the tomatoes in Greece, but they are unlike tomatoes anywhere else in the world. Sublime, particularly in the ubiquitous Greek salads, with large pieces of goat feta. The seafood is also particularly good and the availability of this food – fresh, enormously varied and in great abundance in even the smallest little village – intriguing. Where do they get the tuna, sardines, squid, mussels, octopus, prawns, scallops and anchovies? Anyone who’s dived in the Mediterranean will tell you the water’s unbelievably clear but devoid of sea life. So from where does this bounty come? New Zealand? While Greek wine is mediocre at best, the Mythos beer is excellent, though they serve it in 500ml bottles and drinking a litre at one sitting tends to leave you rather glazed. The most difficult aspect to Ionian chartering is getting there – two long-haul flights and quite a bit of time in airports. But if you have the resilience and a good bunch of friends to share the cost and the experience, it’s worth the effort. But go easy on the Mythos. Until about five years ago chartering in the Mediterranean required only the bareboat skipper to provide a resume of experience. Pressure from the insurance industry and Coastguard authorities has changed that. You now need at least a Day Skipper’s ticket to prove your competence, and your first mate must provide a brief resume to illustrate their abilities. There are plenty of flights between Europe’s main centres and Corfu. Leaving the Ionians is more problematic if you leave from a different port. After delivering the boat to Levkas we flew from the nearby airport at Preveza on the mainland. Flights out of Preveza are relatively limited and cater mainly for the German and Austrian charter market. Most of the flights are to Vienna and Frankfurt, which means a connecting flight to centres such as London or Paris.